Level01 - The FUTURE platform for traders of ALL Types! Thread: Level01 - The FUTURE platform for traders of ALL Types! Online businesses are becoming a crucial aspect of people’s lives, especially for youngsters who seek quick income. And trading comes across as one of the most popular ways of earning online. However, much like everything in the world, here too there are some obstacles that traders need to face, especially ones that are due to the brokers. Whether it is to do with privacy risk, hacking consequences, manipulation, payment getting stuck or other problems, it is always a kind of a headache that no one wants. So, what is the exact solution out of all this? The solution is very simple and that is "Level01", it is a revolutionary project, which is going to transform the way of trading! Level01 is a peer to peer (P2P) derivatives exchange that allows investors to trade options contracts directly with one another, without requiring an intermediary or broker. It is world’s FIRST broker less derivatives exchange in Partnership with Thomson Reuters, and will allow trading derivatives and options in Forex, Stocks, Commodities, Indices and Cryptocurrencies through the highly advanced Level01 platform, without any broker or middleman! 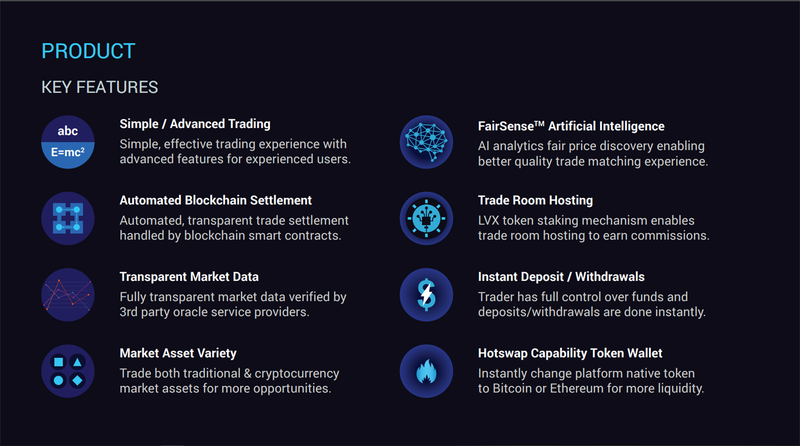 Level01 is a creation through which your trade matches with other trades automatically and that due to the powerful and advanced technology called “FairSense”, it assists trade matching between users instantly and smoothly. All the transactions will be handled by smart contracts on the Blockchain, with no deposit needed due to a system which allows you to use your own Cryptocurrency wallet. ⭐ Peace of Mind/Instant Settlement – Assets are immediately disbursed to a user. ⭐ Fair Market Pricing – Prices are directly from main industry players (Thomson Reuters and Bloomberg) and open for all to view at interbank rates. ⭐ Direct Peer-to-Peer – Users do not have another party that benefits from their losses, which makes It a genuine 50/50 chance. With such dynamic system in place, the thing that actually makes Level01 so dynamic and revolutionary concept is able to bypass brokerage platforms, which makes trading incredibly tougher for traders due to the various disadvantages such as Price manipulation, hidden fees or costs and centralization of authority over the assets. So, by providing a system that is opposite to this will affect the industry in a big way with traders receiving full benefits for their investments and speculations! Level01 is not just a random creation that came into existence, it comes from a team of high pedigree and dignity! It is a team with people of high caliber, experience and class. 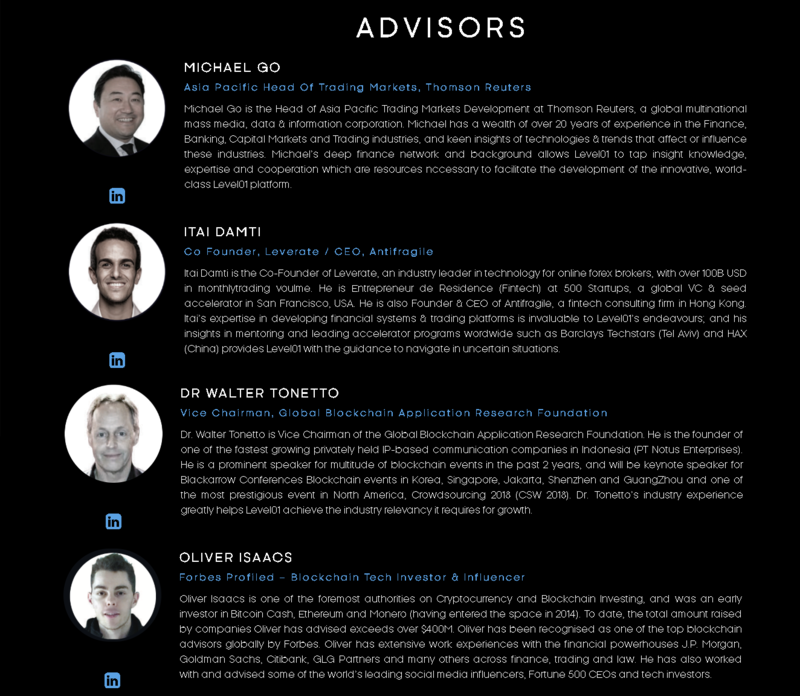 And with all these experts under one roof, the mission is just one and it is to create a place where everyone gets a fair and transparent system to work with. But that’s not ALL, you can get 5% Referral Commission as well for people joining and purchasing tokens through your referral link! So, come be part of the Level01 platform, which will facilitate transparency & equality, and is specifically designed to provide the fairest, efficient, even-level trading field for both the retail and commercial investors. Last edited by Ahsan Lakhany; 09-15-2018 at 02:20 PM. Online businesses are becoming a crucial aspect of peopleÂ’s lives, especially for youngsters who seek quick income. And trading comes across as one of the most popular ways of earning online. However, much like everything in the world, here too there are some obstacles that traders need to face, especially ones that are due to the brokers. Whether it is to do with privacy risk, hacking consequences, manipulation, payment getting stuck or other problems, it is always a kind of a headache that no one wants. So, what is the exact solution out of all this? 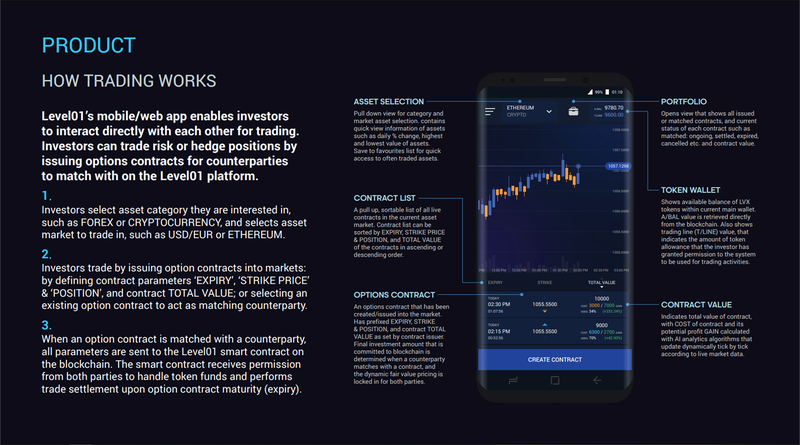 Level01 is a peer to peer (P2P) derivatives exchange that allows investors to trade options contracts directly with one another, without requiring an intermediary or broker. It is worldÂ’s FIRST broker less derivatives exchange in Partnership with Thomson Reuters, and will allow trading derivatives and options in Forex, Stocks, Commodities, Indices and Cryptocurrencies through the highly advanced Level01 platform, without any broker or middleman! Level01 is a creation through which your trade matches with other trades automatically and that due to the powerful and advanced technology called Â“FairSenseÂ”, it assists trade matching between users instantly and smoothly. All the transactions will be handled by smart contracts on the Blockchain, with no deposit needed due to a system which allows you to use your own Cryptocurrency wallet. ⭐ Peace of Mind/Instant Settlement Â– Assets are immediately disbursed to a user. ⭐ Fair Market Pricing Â– Prices are directly from main industry players (Thomson Reuters and Bloomberg) and open for all to view at interbank rates. ⭐ Direct Peer-to-Peer Â– Users do not have another party that benefits from their losses, which makes It a genuine 50/50 chance. But thatÂ’s not ALL, you can get 5% Referral Commission as well for people joining and purchasing tokens through your referral link!